Empire Records should be an unmitigated disaster. It is sloppily made, rambling without any real aim or coherent storyline and yet…it works. there are many film just like Empire Records that follow the same pattern that don’t work, so why should a film, set in an independent record store with a group of young actors who hadn’t quite hit the big time, manage to pull off what others fail? The answer, I believe, is infectious energy. Empire Records is on its last legs. A record store on the verge of being sold to a big corporation, manager Joe Reeves finds that $9,000 has gone missing, thanks to leaving the responsibility in the hands of Lucas, an employee who thought he was doing good when he gambled the money away. Trying to conceal the missing money from the owner, Joe has to content with the arrival of cheesy pop star, Rex Manning, for a signing of his new album, while having to contain his often out-of-control staff . Hated by the critics due to it’s haphazard ensemble story, which drops one idea to be replaced by another without any real conclusion and comparing it to the similar Clerks, Empire Records isn’t as hard-nosed as Kevin Smith’s cult classic and is definitely aimed at a teen audience, hoping that it will be the 90s equivalent to the Breakfast Club. 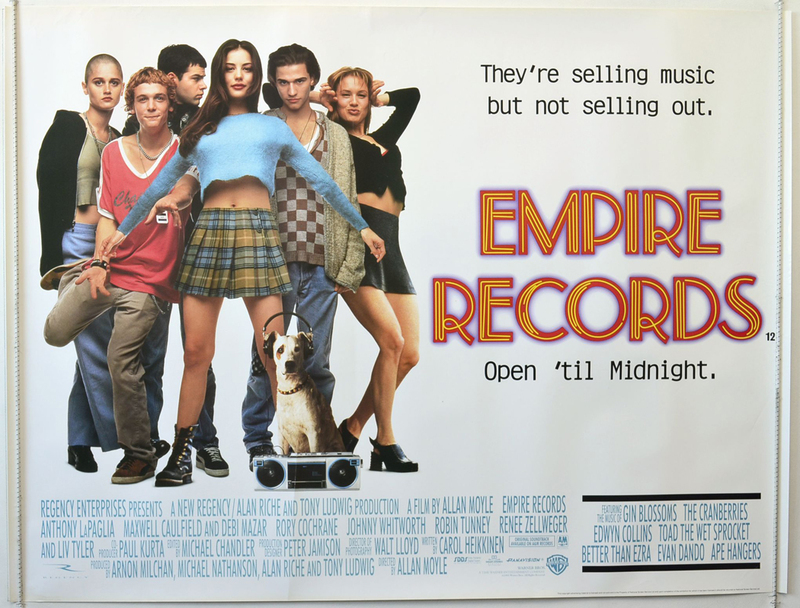 It never reaches that mantle and while you can see the comparisons to Clerks, Empire Records is much gentler affair that has it’s own cult following. There are two significant reasons why the film works as its does: the cast and the soundtrack. The choice of music is pretty close to genius and it could have been quite easy to plump for one genre and leave it at that but director Allan Moyle (who had already taken the teen/music scene as subject matters before with Times Square and Pump Up The Volume) has a keen ear and goes for diversity rather than falling for the trap of rock or MOR rock, we get 49 tracks from AC/DC to The Buggles to Dire Straits to The Cranberries and then some. Then there’s the cast and a glorious collection of misfits you will ever meet. A touch of class is given by Anthony LaPaglia as Joe, the manager who nerves are almost shock to pieces, not only by the uncontrollable staff but the missing money. He has an air about him that makes you believe he would be the manager of a record store and that he could hold court. Maxwell Caulfield is hilarious as the spray tanned, smoothie Rex Manning, the singer who is desperately holding onto a career that faded years ago. His song, Say No More (Mon Amour), could be a cheese classic, with his fobbish outfit. It is the young cast, some of who have gone on to much bigger things since, that are the most infectious. Renee Zellweger, as the man-eater, Gina, is the most surprising. Considering that we know where her career has taken her (Oscar winner), she is an absolute delight here and showing her star quality. Liv Tyler is always very gentle on the eye and here she shows her vulnerable side as the virginal Corey, while Rory Cochrane, who stole Richard Linklater’s slacker comedy, Dazed And Confused, as the drugged out Ron, almost does it again as Lucas, the man who stole the money and yet doesn’t understand why everyone is making such a big thing about it. Spouting mixed metaphors and phrases that make no sense, it’s a hilariously funny performance. The film is funny, did I forget to mention that? Maybe not consistently funny but there are enough laughs to be satisfied but it’s the sheer energy of the cast as they fly around the store, with their episodic stories that never go anywhere. The ending is also very cheesy and predictable but it can also be forgiven for that too. This is a feel-good treat that might not go anywhere but it’s a fun getting there.